Radiofrequency and ultrasound skin tightening combine in safe, effective, and nonsurgical procedures that firm and rejuvenate the skin on the face and body with noticeable results after just one session. Sculpt, tighten, and improve your skin’s elasticity and surface by enhancing collagen and elastin production in targeted areas. Revive the taut, toned look of your younger face, tighten the skin around your stomach post pregnancy, and much more. Sophisticated devices are used to treat the most common problems related to aging such as sagging or lumpy skin, wrinkles, cellulite, and excess fatty tissues. Non-surgical, heat energy treatments stimulate healing, boost collagen and elastin production, and significantly improve the skin’s elasticity through tissue remodeling and skin tighening. The result is smoother, tighter, healthier, and younger-looking skin. Radiofrequency is essentially heat energy that has been scientifically proven to sculpt and reshape the body and face from beneath the superficial layer of skin. This heat energy penetrates soft tissues beneath the skin’s surface – at the deeper dermis level – without affecting the upper epidermis layer. Working with the deepest layers of the skin causes the tissues in that area to compress and realign, dramatically speeding up the collagen production process, which normally takes many months to complete. Once healthy, new collagen is present at the dermis level, exposure to additional radio frequency tightens and sculpts the tissue, resulting in a more youthful and elastic surface. To optimize results, radiofrequency is sometimes combined with ultrasound therapy. Ultrasound devices were first approved for eyebrow lifting in the USA in 2009, and have subsequently been used for treatment of skin and tissue laxity. Ultrasonic energy is used to produce specific micro-coagulation zones deep in the dermis and subcutaneous adipose tissue. Repair of the deep tissue damage leads to contraction and tissue remodeling in the months following treatment, which results in the desired skin tighening effect. Since the superficial dermis and collateral tissues are spared, the risk of scarring and downtime is decreased and Ultrasound can be effective for different skin types. 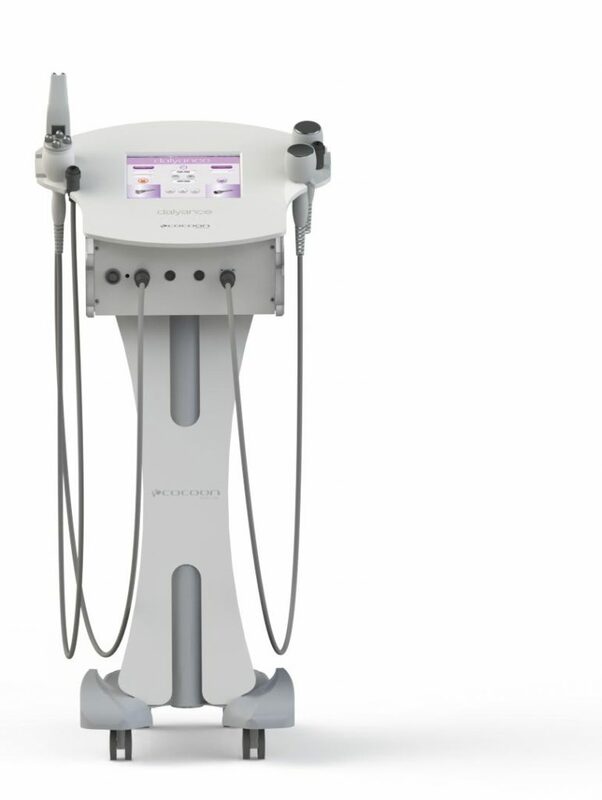 The Dalyance machine effectively combines radiofrequency and ultrasound technologies for facial rejuvenation, skin tightening and body contouring. The combination of both technologies allows both heating and tridimensional pressure of the adipose tissue of the treated area so the effects are more immediate and cost effective. The aging process, UV exposure, pregnancy, extreme weight loss, genetics, and lifestyle choices all determine how soon your skin will begin to lose its elasticity (connective tissue breaks down and skin becomes lax) and show signs of ageing. Radiofrequency and ultrasound skin tighening therapies benefit people who want to make moderate improvements to their face or body without risking the potential long-term consequences of undergoing surgery. If you’re looking for a natural and non-invasive way to improve and tighten the surface of your skin (face, neck, chin, dècolletage, stomach, arms, inner thighs), Radiofrequency may be your best alternative. Before your session, you’ll meet with a registered practitioner who will examine your skin and help you determine if radio frequency is right for you. Although improvements can be seen after just one 30-60 minute session, eight once-per-week sessions are recommended for maximum results. Absolutely. All of our technologies including Dalyance are TGA (Therapeutic Goods Administration) approved, meaning your can be sure they are regulated by Australia’s Department of Health and are safe to use. You may experience redness, swelling or burning of the treatment area immediately after the procedure, but these side effects are normal and dissipate in 24-48 hours. If you want to improve the condition of your skin book a free consultation today and we will work carefully with you to create a personalized treatment plan to leaving you looking great and feeling confident.